Home/Uncategorized/We are looking for enthusiastic, curious and thoughtful people to join our volunteer team! We are looking for volunteers! If you are interested, please read the text below carefully before applying! We are particularly keen to hear people from migrant background to make our team even more multinational and involve more migrants in our work. We are looking for enthusiastic, curious and thoughtful volunteers who will be part of the Detention Forum’s growing volunteer team, communicating, thinking and acting together in order to trigger a lasting positive change to the UK’s immigration detention system and for those who are affected by it. You need to have a deep interest in and commitment to migrants rights movement and challenging immigration detention, but you do not need to be immigration detention experts. What’s important to the volunteer team is that we communicate and act in order to change the system, and to do so together with people with lived experience of immigration detention. We give this process a serious thought and we are looking for people who can be part of this process. Essentially, we are trying to strengthen and amplify a narrative of change, which the Detention Forum has been working on since 2009.
scanning for immigration detention related news to disseminate over Twitter. writing small pieces of detention-related news which support our asks that we can share with others. We need to stress that this is volunteering: it should be fun and rewarding. We take the approach of “we do what we can do” within our volunteer team. This means that we are flexible and we accommodate each other as much as possible. We also rely on each other to inspire each other with our creativity. Commitment to work with migrants as equals, not treat people as “case studies”. 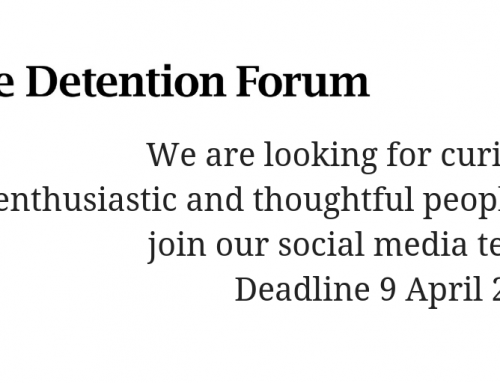 If you are interested in volunteering for us, please send the following to detentionforum@gmail.com by Monday 5 March 2018. Interviews for the short-listed candidates will take place on Thursday 8 March. a short written piece, up to 300 words, on immigration detention (you can write about any topic and theme relating to immigration detention). If you have any questions regarding this volunteering opportunity, please contact Alice at unlockingdetention@gmail.com. Because of our limited resources, we are unable to provide feedback to everyone’s application. We will contact those who are shortlisted for interview on 6 March to invite them to Skype interviews on 8 March. 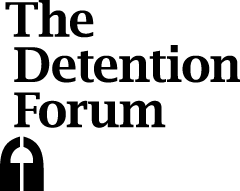 The Detention Forum (DF) is an advocacy network of organisations who came together in 2009 to fundamentally challenge the UK’s use of immigration detention which affects undocumented migrants and their communities. Based at the Refugee Council, our part-time Project Director works with members and others to drive and implement its revised Theory of Change (2017-2020) which envisages an opportunity for radical detention reform. 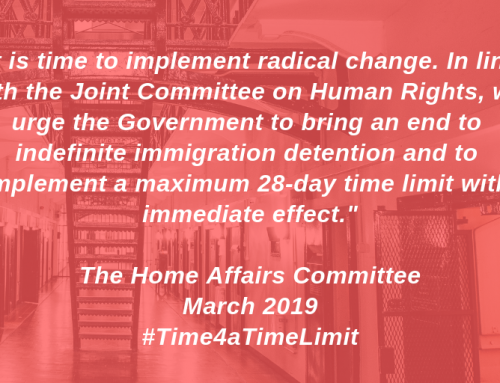 Our aim is to significantly reduce the UK’s use of immigration detention and restore dignity of individuals and communities affected by harm of immigration detention. We mobilise the diverse campaigns and voices and coordinate effective parliamentary, policy, campaign and communications activities around clear shared asks and messaging. It has already transformed the narrative around detention which was long-seen as the most difficult to influence. Our agreed four key asks are: 1. Ending indefinite detention; 2. Ending the detention of vulnerable people; 3. Automatic judicial oversight; 4. Community-based alternatives to detention. Over the years, the Detention Forum has put detention reform on the political agenda. Our lobbying made detention one of the central issues in the passage of the 2016 Immigration Act, resulting in legislative changes including automatic judicial oversight for the first time. All except one of the major political parties have now made manifesto commitments to a time limit, and our asks are central to the calls for reform in parliament. In 2014-15, we supported the crucial All-Party Parliamentary Group detention inquiry and provided much of the evidence that ensured that the report gained cross-party buy-in, managed dissemination of the findings and used it to drive change. The Government responded with its own Shaw Review, which the Government to pledge detention reform in 2016. This is leading to the closure of three detention centres, and a 25% reduction in numbers in detention since 2013. But this is not good enough for us and our work continues. Our Project Director works one to two days a week alongside a team of seven volunteers. Our member organisations meet every quarter in London and our Co-ordination Group members communicate with each other regularly, to analyse context, share intelligence and strategise about next steps. We are in the process of putting together a workplan for 2018/19 based on our Theory of Change. Our volunteer team is proudly diverse and multinational, made up of people coming from different countries, backgrounds and with unique skills and perspectives. Volunteers play an active part in our collective action and thinking around communications: they manage our Twitter account, take part in meetings, gather information and come up with great ideas for the Detention Forum – and implement them. In 2018/19, we want to expand a range of ways that volunteers can help communicate the work of the Detention Forum and our narrative of change, if our resources level allows this. Our popular annual social media project, Unlocking Detention, is run mostly by our volunteers: the next “tour” is going to start in October 2018. Communications is always a tricky issue, particularly in the field of migration, human rights and social justice, topics that are politically volatile and polarizing – but we believe communications is a very important part of social change process and needs to be taken seriously. The team is always grapping with this challenge and we often discuss how we should be responding to our ever changing environment. What we want to do – to drive a narrative for change – often seems like more than what we can afford to do in terms of our available resources: but we do our best and try to make our team efforts as exciting as possible. Very frustratingly, we cannot afford to have an office so we all work and volunteer form home. Ideally, we want to have more capacity and we are working towards it through fundraising. Lack of office space is clearly a disadvantage because it restricts the amount of time we can spend together to analyse our context and discuss our approach. On a day to day basis, we work largely independently and communicate with each other over emails and Skype, usually once a week. We organize volunteer socials every quarter in London and they are also encouraged to take part in our Quarterly Meetings, though those who are in full-time employment find it difficult to do so. Volunteering at the Detention Forum therefore can involve a lot of thinking and mental energy. 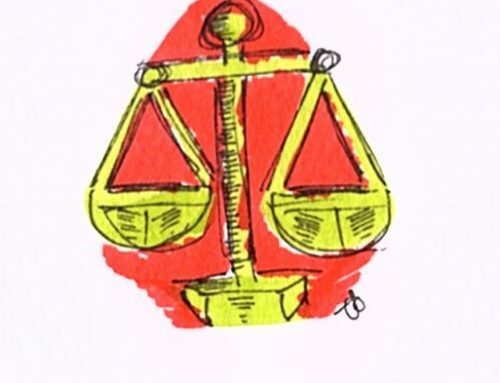 However, you will get to learn more about immigration detention and you will have a chance to learn how groups like the Detention Forum, its members and other groups around the UK are working towards social justice and dignity for migrants. Join us and be part of the change we want to see.